I almost didn’t get to view this movie. As many of you know, My Hero Academia: Two Heroes was released at theaters in the U.S. on a limited engagement thanks to Funimation. I purchased tickets for the first showing with the English dub, and due to a malfunction at the theater, I was unable to see it. With every other showing sold out, it seemed like all hope was lost. Then, out of nowhere, I was able to score two tickets purely based on luck. Now, having seen it, did it live up to the superhero-sized hype surrounding the franchise? It shattered any notion of this film being a filler or mediocre in the slightest. For those that aren’t familiar with the franchise, here’s what the anime is about: superheroes. Plain and simple. In the world of My Hero Academia, the majority of people are born with powers, also known as quirks. This makes for an exciting environment, filled with heroes and villains and those that just want to live everyday lives. Izuku Midoriya was one of the few born without a quirk, which made it hard for the teen to live out his dream to be like his hero, the #1 hero All-Might. After a chance encounter with All-Might, Midoriya ends up being chosen as All-Might’s successor and is passed down the heroes power, One for All. With quirk in tow, Midoriya joins the prestigious hero school, U.A. as he trains to become a hero, along with his classmates. Think X-Men Xavier Mansion, but as an anime and with characters and plots all it’s own. For this feature-length anime, Midoriya and All Might travel to I-Island for the I-Expo, an exhibition of quirk abilities and support innovations. This film takes place in-between season 3 of the anime series, with an episode even serving as an interlude to the film. On I-Island is Dave Shield, an innovative inventor, and friend of All-Might, as well as his daughter Melissa, who is also quirk-less. We see the history between All-Might and Dave, including a fantastic opening to the film set in the Golden State of California. The gang is all here on the island as well, as Midoriya’s classmates all found ways to the expo. But the focus here is on Midoriya, All Might, and All Might’s connection to Dave. A villain arises and wreaks havoc, putting the young heroes to the test and forcing them to save the day, the island and All-Might. As menacing as the villain was, it is the relationships here that steal the show. The comradery between All Might and Dave was fantastic to see, and the mentorship All-Might continues to give to Midoriya is always welcome. Not to say the action scenes weren’t great, they were fantastic. The fluid movements and hard hitting scenes were expertly done. The end scene is epic, just as you would expect from the world of My Hero Academia. 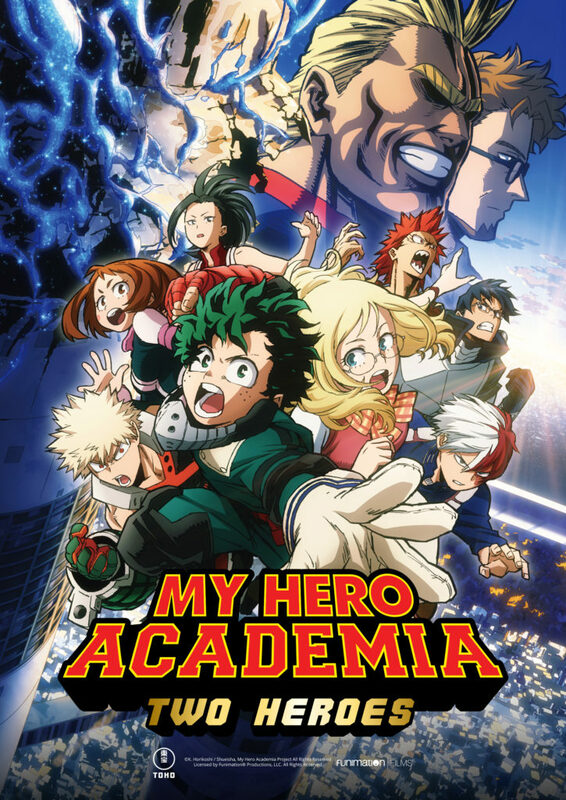 The English voice cast includes Justin Briner as Midoriya, Christopher Sabat as All-Might, Ray Chase as Dave Shield, and Erica Mendez as Melissa Shield to name a few. I am always blown away by the voice cast for My Hero Academia. I know there are many that prefer the original Japanese voices with English subtitles, which is fine. But for me, the English voice actors display the art of voice acting perfectly, and if you haven’t given the English version a shot, you are missing out on something great. I loved the film, as it didn’t feel forced, or like a filler episode as most anime movies feel like in my opinion. This had everything that makes the anime series a hit and more. With connections to the current season, this movie feels like an organic fit for the franchise. Funimation went all out plus ultra with My Hero Academia: Two Heroes, and does justice to my favorite anime out at the moment. For more information, make sure to visit Funimation.com. Next Winner of the Ant-Man and the Wasp Blu-Ray Announced!